Featuring 20 titles including Final Fantasy VII, Tekken 3, and more. 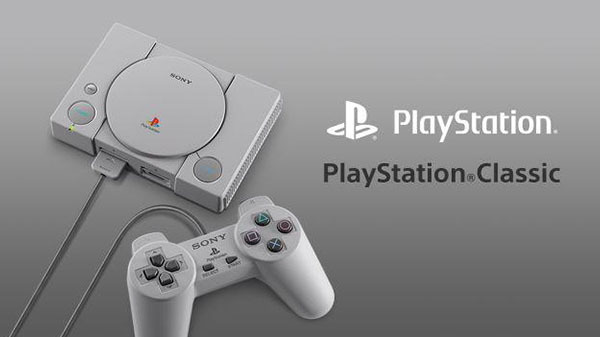 Sony Interactive Entertainment has announced PlayStation Classic, a miniature games console that mirrors the look of the original PlayStation and comes pre-loaded with 20 games. It will launch in limited quantities on December 3 in North America, Europe, and Japan for $99 / €99 / 9,980 yen. The design of the miniature console resembles the original, including the button layout, two included controllers, and outer package. It is 45 percent smaller on the sides and 80 percent smaller in volume than the original console. It includes an HDMI cable for connecting to external displays, and a USB cable which needs to be connected to a commercially sold USB AC Adaptor for power supply from the plug. Select titles will support local multiplayer gameplay using the two controllers. Watch the announcement trailer below. View a set of images at the gallery.